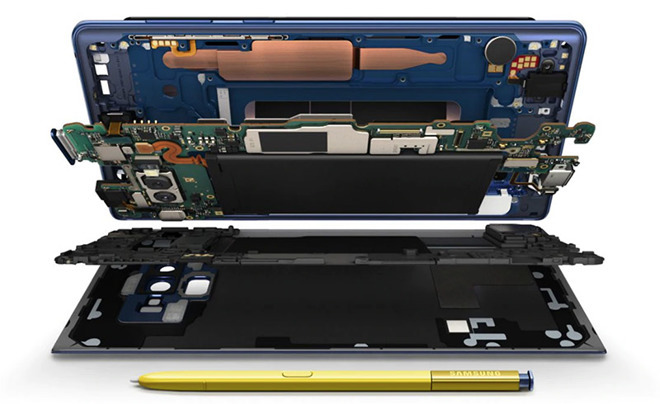 Announced at a media event on Thursday, Samsung's new Galaxy Note 9 comes packed with a Qualcomm Snapdragon 845 processor, the same CPU that powers the Galaxy S9 and S9+ released in March. Also like the S9, the new Note 9 sports 6GB of RAM, or 8GB when purchasing the top-tier model with 512GB of onboard storage. Putting Samsung's device to the test, Tom's Guide ran a series of benchmarks and compared the results with past performances logged by competing Android handsets, as well as Apple's iPhone X. Starting with Geekbench 4, the Note 9 managed a multi-core score of 8,876, a more than 2,300 point improvement over last year's Note 8. The 6.4-inch phablet also outperformed its Galaxy S9+ counterpart, which put in a score of 8,295, making it the fastest Samsung handset available today. OnePlus' eponymous OnePlus 6, which comes toting 8GB of RAM, was the only Android device to turn in higher marks with a score of 9,088. Apple's A11 Bionic SoC, as found in iPhone X with 3GB of RAM, outperformed all comers with a multi-core score of 10,357. Moving on to graphics testing, the publication ran the demanding 3DMark Slingshot Extreme 3.1 test to find the Note 9 best its S9+ forebear with a score of 4,639. Apple and OnePlus both beat Samsung with scores of 4,994 and 5,124, respectively. It appears 3DMark has optimized its test suite since Tom's last ran the evaluation, as the S9+ previously hit a tally of 5,793, while the iPhone X notched 3,998. Today's results are to be expected considering Samsung is using a fairly old-in-the-tooth Snapdragon processor. Benchmark standings are due to change this fall, when Apple is expected to release a slate of new iPhone models presumably powered by a next-generation "A12" CPU. Little is known about the chip, though the silicon is anticipated to be designed in house and fabricated using TSMC's 7-nanometer process. In June, an unverified Geekbench entry saw a mystery "iPhone11,2" device with "A12" CPU turn in respective single- and multi-core scores of 4,673 and 10,912, and a compute score of 21,691. The figures are a significant improvement from iPhone X, which averages 4,206 and 10,128 in single- and multi-core tests, respectively, and a Compute score of 15,234. Stay tuned to AppleInsider for more on Samsung's Note 9. We will be putting the new handset through the paces in the coming weeks, including in-depth testing and real-world comparisons with Apple's latest hardware.